Recover vehicles, trailer your boat , and pull stumps. Heavy duty winch gives you up to 6000 lbs. of pulling capacity for rolling stock. 2000 lbs for straight pulling. Corrosion resistance housing with convenient carrying handle. 6Ft per minute with full load. 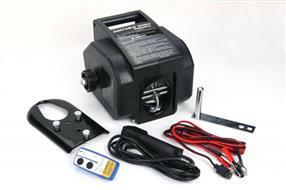 Motor voltage: 12V DC, 25 AMPS, 300W input power.